My card features the adorable puppy dog from the Dare 2B Artzy Ruff Day stamp set. Anyone that knows me, knows I’m a huge animal lover! My husband always says that if it weren’t for him telling me “NO” to every animal I see and want to bring home, I’d have a house full of animals. That’s probably true? When I think of our pets (3 rescues from Animal Shelters), I think about how much I love them and how happy-go-lucky they are. That’s all any animal wants is to be loved and to be part of the family. All you need is love (and a dog or cat who will love you in return unconditionally)! To start this card, I stamped the cute dog with the little patches on him with some black ink and heat embossed with some clear embossing powder. I colored him with my Copic markers. I kept his colors very neutral using brown and tan (modeled after my first Doxie, Charlie). I colored the pup and used the matching Dog Die to cut him out. I love that there’s a matching die for this set. Next, I started on my background. I used some brown and lipstick pink colored ink and sponged it onto a piece of white cardstock that measured 3 ¾ x 4 ¾. I sponged each color to about the half way mark and stopped with just a slight bit of overlapping blending. Because the ink I used stays damp for a while, I was able to lightly dust on some Perfect Pearls over the area that was inked. I used Interference Violet on the pink side and Cappuccino for the brown side. Once the entire panel had a nice layer of shimmer on it, I pulled out one of my deep embossing folders and embossed the background. Since the ink is damp, it doesn’t completely remove the Perfect Pearls so you still have a nice shimmer to the background. From the Ruff Day matching die set, I used the LOVE die with the little paw print and cut it from some Kraft cardstock. I used the same die and cut it out of one of the two stitched circle die cuts from my craft stash that I’d made with some salmon pink paper. I glued the two stitched circles together, using the one with the die cut Love on top. I then glued in place the Love that I’d cut from the Kraft cardstock. Once the glue was dry I punched two small holes into the top of the circle and added a bit of bakers twine to it and set it aside. Next, I used the super cute tiny envelope die from the Mailbox Gift Card Holder Die Set and the You’ve Got Mail matching stamp set, to create the little envelope that the dog has in his mouth. 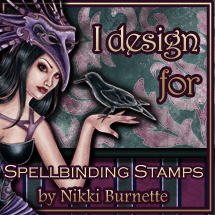 This stamp & die set is a new 2017 release and every one of the DT ladies including myself absolutely loves this set. I cut the envelope from some cream colored cardstock and stamped the front of the envelope with the little postmark stamp in blue with the Dare 2B Artzy premium ink in Midnight Blue and then stamped the Special Delivery in Pomegranate ink also from Dare 2B Artzy. I glued the back flaps of the envelope together to keep them closed so that they’d lay flat on my card front. Finally, I stamped the sentiment, I Wuff You from the Ruff Day stamp set using some Midnight Copper embossing powder from Lindy’s Stamp Gang. I really like the way the dark brown pops against the off white cardstock. Once the sentiment was heat set, I die cut it out using a smaller stitched circle. I added the little heart die which is also from the Mailbox Gift Card Holder Die Set. I glued the heart in place just above the sentiment. To assemble my card, I cut a piece of 110lb white cardstock to a finished card size of 4 ½ by 5 7/8. Since my cardstock was such a bright white, I actually sponged on a light amount of brown ink around the outer edges so that it would match the rest of my card better. I layered on top of my card base two pieces of cardstock; one in salmon pink that measured 4 ¼ x 2 inches and a brown piece that measured 4 ¼ by 3 1/6. I used a piece of cream colored cardstock to cover the seam where the two pieces are joined. On top was my embossed panel which I added using some dimensional foam. The dog, envelope and two sentiment circles were all added to the top layer using some dimensional foam as well. Now it’s your turn. We want you to join this challenge and share your amazing Dare 2B Artzy creations that feature the All You Need is Love theme. There’s an amazing Dare 2B Artzy prize up for grabs so you want to be sure to get your submissions in before the end of February! We can’t wait to see what you create!! Hope everyone will join the All You Need is Love challenge this month. The team is looking forward to seeing your Love inspired projects featuring Dare 2B Artzy stamps & dies! Happy Stamping! Love the way you combined the dog and mail sets! Thanks Melody! Both sets are so cute and so much fun, I couldn’t resist making a card with both.